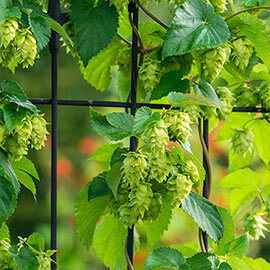 Columbus Hops vine | Gardens Alive! Columbus Hops is a vigorous, high-yielding vine that beer brewers love, particularly for bitter ales and American IPA beers. The young vines can be eaten fresh in salads or prepared as you would asparagus. The flowers make lovely arrangements fresh or dried. Try tucking the dried flowers under pillows or brewing as a tea to aid with sleep! 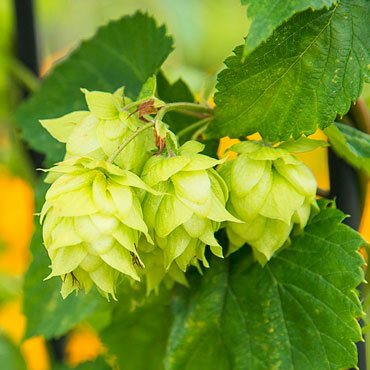 Columbus Hops is often used medicinally for its antiviral, antioxidant properties, too. Use arbors or fences to support it, since this vine can grows between 10-20' tall. The female cultivar bears large flowers, resembling cones, with super high alpha acids and oils. Zones 3-8. Not available in ID, OR, WA. Spacing: 3 1/2 feet apart in rows 7 feet apart. Foliage: Attractive deeply lobed green leaves. Soil Preference: Well-drained, sandy loam soil with a pH of 6-7.5. Growth Rate: Can grow up to one foot per day. Pruning: Cut off the first growth of bines (vines). Three to four weeks later more vigorous bines (vines) will grow. Once the hops cones are harvested, cut the bines (vines) 2 feet from the ground. Keep the bottom growth which will make the plant hardier for next year. Flowers: Fruit/flower: Female plants bear larger flowers resembling cones. Super high alpha acids and oils. High bittering qualities; used primarily for dry hopping.